OTA Training, the creator and producer of the NFC Bootcamp™ series is all set now to hold its first international Bootcamp at #Screenmediaexpo in London (something we suggested and lobbied for). The NFC Bootcamp will be presented on Wednesday, 16 May and Thursday, 17 May 17 2012 and will run from 9:00am to 5:00pm each day. As a special feature of this inaugural European NFC Bootcamp event, the NFC Showcase™ will be located right on the #Screenmediaexpo trade show floor where attendees from both events can experience first-hand how NFC works from the world’s leading NFC companies. Sponsors of the Bootcamps include some of the best of breed NFC ecosystem companies such as Device Fidelity, Identive, ACS, Cellotape, Blue Bite, Mobile Monday Seattle, Maxim, NFC Jobs and supporting organizations like ourselves, The Smart Sense, EMF and ScreenMedia Weakly. 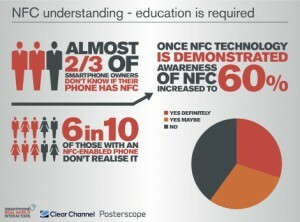 To register for the NFC Bootcamp, visit www.nfcbootcamp.com – be quick as space is limited for this inaugural event. This entry was posted on Friday, May 11th, 2012 at 06:52 @328 and is filed under DailyDOOH Update. You can follow any responses to this entry through the RSS 2.0 feed. You can leave a response, or trackback from your own site. Interesting statistic – suggests that 40% of people aren’t aware of something that they’ve just been shown…?